Home » Build Muscle » Muscle Building Nutrition » Is Your Paleo Diet Holding You Back? Is Your Paleo Diet Holding You Back? I remember the first time I heard about the paleo diet, it was in 2010 and a ridiculously ripped guy was describing it while in the Men’s changing room of the gym I was working at. “Yeah, so you can only eat foods that were available to people who were alive during the Paleolithic era. Real food that you could get hunting or gathering”. The idea was that eating these foods is how we (humans) are supposed to eat, and that the paleolithic diet was as close to a “natural” diet as possible. It’s quite a nice thought really, abandoning junk food, processed food, and coca cola in exchange for fresh lake water, a handful of seeds, and half an antelope. I imagined replacing my weekly shop only with foods that I had sourced myself, sadly I lived in North West London at the time which meant that I had a choice of fox, pigeon, or pet cat to hunt (and cat is a seriously overrated meal). Also, the cynic in me already hated this guy and everything he stood for. He sounded very smug to me. I have never had a problem with people doing things differently to the general public. In fact I believe that it is necessary for human progression. But there are two types of people who do this. There is the neck-beard sporting nerd (or female equivalent) who does it quietly and earnestly, they won’t force their diet on you, but if you ask them they’ll be more than happy to chew your ear off (another paleolithic trait). Then there is the smug, arrogant, moralist. The kind of person who announces that they are paleo in a gym changing room. The type of person who brings their own meal to a dinner party, and looks down on anyone who doesn’t follow their specific, niche, diet. This guy seemed like the latter, and immediately I wanted to learn enough information to ruin this diet for him. I wanted to smugly walk in and say “Oh the paleo diet? I believe that was disproven yesterday” while stroking my beard and raising my arm for the surely inevitable high-fives. As you can see, in 2010 I was as awful as the people I hated. Luckily, I didn’t challenge him because 1) I was a fitness instructor in a Private Member’s Club – I had less power than a serf in 15th Century Russia, and 2) I was wrong, not factually but morally. I now believe that you should never try to look down on someone’s diet, provided that it works. And the paleo diet does work. In this article I am going to bring up several legitimate (at least in my opinion) arguments against the paleo diet. But that does not mean that the diet doesn’t work. If you are currently loving your paleo diet then please continue. Some people suit diets perfectly, whether the diet is perfect or not (and no diet is perfect). Firstly though, I am going to look at what the Paleo diet is, and when it started. Started by Ug the caveman* 2.6 million years ago, the Paleolithic diet was a much simpler diet than the diet we have today. Bread wouldn’t be invented for 4,000 years after the end of the Paleolithic era and humans would not start drinking milk for 500 years after the paleolithic era. Because the Paleolithic era was so long ago, there is a lot of guesswork about what the diet would have looked like. One thing that everyone agrees with though is that the diet would have been very different depending on where you lived and when. A lot of Paleo dieters act like the Paleolithic period was the sixties, a nice short decade with some awesome music and debatable fashion. But we’re talking about a time period that was over 2 million years. For a large part of the paleolithic era fire had not been invented! Many scientists believe that our diet during this period would have been similar to the diet of modern-day chimpanzees. A lot of fruit, some tubers (potatoes and other root vegetables), and lots of delicious bugs. Protein would have made up an absolutely tiny percentage of their diet, and most of this would have come from carrion (dead animals that were found – like road kill). But as I mentioned earlier, diets would be vastly different at different times and different locations. While many humans would be enjoying a fruit-based diet, others would be eating shellfish, or hunting antelope, or eating whatever they could find. If there is ONE thing that unites anyone living in the Paleolithic era it’s a lack of fussiness. Believe me, if a human from that time walked into a supermarket today they would eat whatever they could. Because these people were fighting starvation. This is the biggest criticism I have of the paleo diet, it completely ignores the reasons WHY people ate the way they did. Because they didn’t have a choice. If you are one meal from starvation you would happily eat a slice of bread, gluten or not! According to Wikipedia** the idea for a modern version of the paleolithic diet was presented by Walter Voegtlin in 1975, but the idea that primitive diets were superior to modern diets is something that had been believed by some as far back as the 19th century. It exploded in popularity in 2012, and a 2002 cookbook Loren Cordain was used as a basis for the diet. Cordain asked followers to avoid dairy and almost all grains, to consume a diet high in lean meats and seafood, and to eat vegetables, fruit, nuts, and seeds. So far, there are very few dieticians or nutritional scientists would have a problem with this diet. They may point out that unless you are allergic to dairy or gluten, there is no problem with either, but they would not advise against this diet. Nor would I. 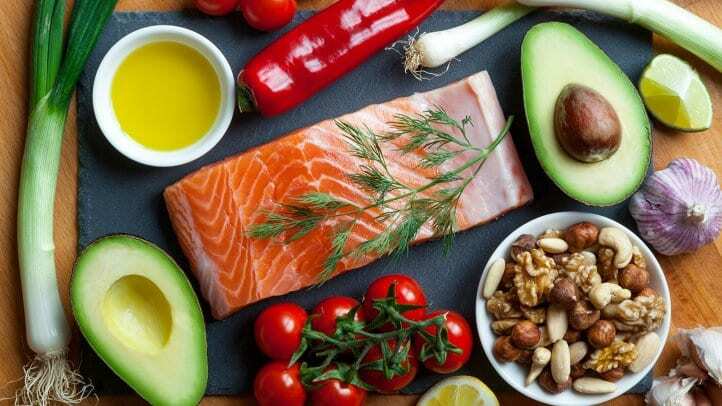 If you eat a diet that contains lean meat, vegetables, fruit, nuts, seeds, and avoid junk food, alcohol, and high-calorie meals, you will almost certainly lose fat and live a healthier life. The problem is that the paleo diet has been portrayed as the only healthy diet, and that by avoiding dairy and grains you are HEALTHIER than others. This is not true. In fact, you could even be less healthy. There are many benefits to consuming dairy products, avoiding calcium deficiency is just one of them. There are also benefits to eating grains. They can be high in fibre, they are satiating, and they taste amazing! The main argument made by Cordain was that before we started eating grain and dairy there was almost no incidences of diabetes, heart disease, or obesity. But this is not really a fair representation of what happened. When we transitioned from hunter-gatherer to agriculture humans started to live much longer, we were protected from being hunted, we had better access to food, and as a result we lived longer, fuller lives. A hunter-gatherer did not live long enough to die of heart disease, nor did they live long enough to die of cancer or suffer from arthritis. Cordain also forgets that a hunter-gatherer lifestyle is as different from modern life as it is possible to be. Humans were smaller, leaner, and less intelligent. Compare the inventions during the paleolithic era to the inventions in the 3,000 years afterwards. Look at how modern society has progressed since the Industrial revolution (when mass produced food started). Life has changed more in the last 100 years than it had in the previous 10,000. Hunter-Gatherers would have been malnourished, and we know that this can affect height, weight, intelligence (you try thinking straight when you haven’t eaten in 3 days), and reproduction. Today we live lives where we actively have to schedule in exercise because we spend so much time sitting down. A time where we can easily receive every vitamin and mineral required to live a healthy life. If you love following the paleo diet, and you find it easy to do then the paleo diet is not holding you back at all. Please continue. Just don’t start preaching about how much better it is than other diets. It isn’t. If you have lost weight then that is because you are in a calorie deficit (eating less calories than you are burning). Not because of some magical paleolithic properties. Also, remember that you are NOT following a diet that your paleolithic ancestors followed. You are following a diet that was created in 1975 and polished in 2002. You are not even following the spirit of the paleolithic era, as I mentioned earlier, an actual caveman would eat whatever they could get their hands on. If you are following the paleo diet out of a sense of duty, and you are not enjoying it, then please, for the love of God stop doing so. The paleo diet is difficult to follow, has a bunch of confusing rules, and is less healthy than a well-planned diet that gives you more options. More options = greater chance of getting all micronutrients. There are a few benefits of following this diet, and it would be crazy for me to ignore them. Firstly, the paleo diet will suit a certain type of dieter down to the ground. The kind of person who makes a New Years resolution in 1998 and is still following it today will LOVE the paleo diet. The rules may be restrictive (more on that later) but they at least make some form of sense. If you ignore the fact that no paleolithic person actually ate this way, you can still see where the creator is coming from. Cooking venison over an open fire with a selection of vegetables, nuts, and seeds, has quite a romantic appeal to it. Compare that to the microwave lasagne you ate right out of its container the other day and see which one is more inspirational. There is a lot of fruit and vegetables allowed in the paleo diet, and this is a great way to hit your micronutrient targets. Many of the foods that are restricted on this diet are very unhealthy, so it may be easier to give them up. The paleo diet encourages you to be a better cook. You will need to learn recipes, or grow your own vegetables, forage for mushrooms etc … You are thinking more about what you are eating, and appreciating the food for what it is. There is no mindless eating on the paleolithic diet. Who on earth has time to forage for wild mushrooms? Who has time to grow their own vegetables? Who can afford to feed themselves and their family venison? Upper-middle-class people with more money than sense, that’s who. Okay there are ways to follow a paleo diet that don’t break the bank, and don’t require you to forage for foods like a bloody badger. But so much of the paleo diet revolves around impractical beliefs. For example, type in “paleo baking” into Google and you will find hundreds of recipes for brownies, cakes, and cookies that are “paleo friendly”. These recipes are often HIGHER in calories than the originals, and are clearly not from the paleolithic era. But some people would rather spend 3 hours baking cakes with no flour in them than eat something that isn’t paleo, and that is ridiculous. Following these recipes is going to cost a fortune, as is only eating organic, or buying ethically caught fish or whatever. This is a diet for the affluent, and it doesn’t really provide any benefits that a normal diet wouldn’t. This solution will not go down well with the paleo crowd, and nor will it go down with the anti-paleo crowd. But who cares what either of those nerds think? Personally, I would not bother with the paleo diet at all, but if I had a friend who wanted to follow it this is the advice I would give them. Take what is good about the paleo diet: The absence of junk food, the reduction in calories, the variety of lean meats and fish. You can even follow the ratios recommended by Cordain (55% lean meat, 15% fruit, 15% veg, 15% nuts and seeds), though you don’t have to. But, only follow it 80% of the time. There is a great rule used by many nutritionists which is the 80:20 rule. Eat good, healthy food 80% of the time, and have less healthy foods the other 20%. Don’t stress out about paleo cookies, just eat a regular one. It will probably contain less calories in the first place! Don’t fear bread or milk. We’ve had both in our diets for 7,000 years or more. Don’t bring your own food to a BBQ or dinner, you’re not vegan! Relax, and don’t be afraid of social situations where your diet may suffer. It’s the meals out with friends and big Xmas dinners that people remember for decades afterwards – not that time you ate a Tupperware box full of beetroot salad while your friends ate pizza (okay most of your friends probably will remind you of that).